NorfolkRiders.co.uk • View topic - New year... new ideas.. So it's 2010, a new year and /hopefully/ the weather will start to get better. Anyone have any suggestions to help promote the forum ready for the summer? or want to see something new or changed on the forum? Re: New year... new ideas..
Could we have youtube videos embedded? They've got it on EOEB and Trackdayriders if you know what you're doing. Is it me or is the forum really quiet atm? Are people promoting the site? I've not had much time to get out on the bike at all atm, and even less time to try and promote the site. Does anyone have any ideas on how to get the forum nice and busy? oily85 wrote: Could we have youtube videos embedded? They've got it on EOEB and Trackdayriders if you know what you're doing. Noted, will see what i can do. WOn't be just yet as i'm uber busy atm as you know. Been wondering where everybody is. 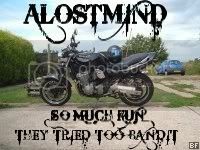 alostmind rules all topics ! but for how long ?